July 20, 2012 / Raleigh, NC: Tom Curran, past president and long time member of the NMRA was inducted into its Hall of Fame in ceremonies held at the Carmichael Gym on the NC State University Campus. 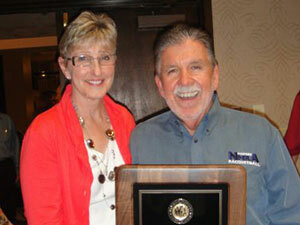 Tom was honored as the 2012 Inductee for his contributions over 15 years of his membership. He is pictured with Cheryl Kirk, past president of USA Racquetball, who presented the award and detailed his service and support to the NMRA and USA Racquetball as a member, board member, and officer of both organizations. Bruce Adams presented a snapshot compilation of Tom’s life which highlighted his family, careers and interests. Tom’s short acceptance speech focused on his love of the sport, and especially the NMRA, since the organization supported all of the characteristics of sportsmanship, dedication, friendship, and loyalty that have guided his personal life.